Floodwaters from the swollen Iowa River cover part of City Park in Iowa City. Persistent heavy rainwater, collecting throughout east central Iowa’s Cedar and Iowa River basins is flowing downstream to Cedar Rapids, Iowa City and dozens of other communities. 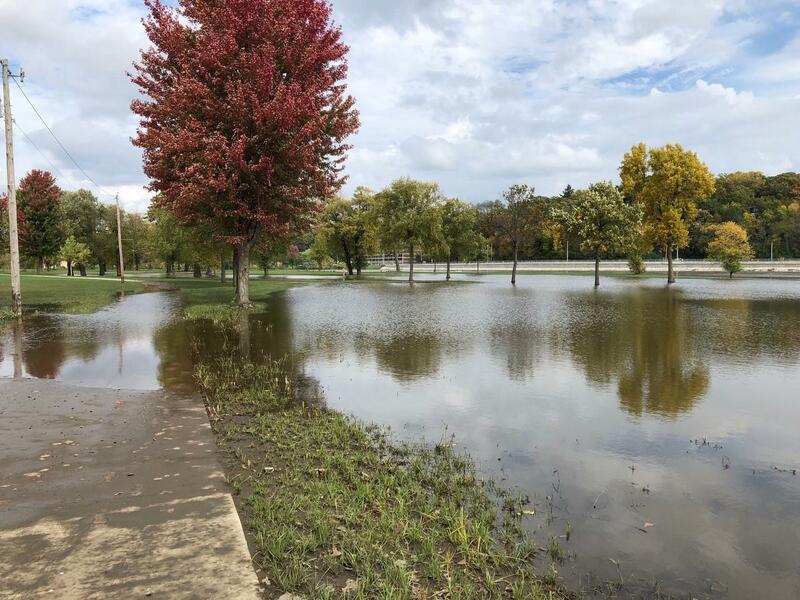 The Coralville Reservoir, currently using 76 percent of its capacity storing excess flow from the Iowa River and other streams upriver from Iowa City, is forecast to rise within a half-foot of uncontrolled flowing over the dam on Monday, October 15. On Wednesday, the Corps increased the Coralville Lake outflow to 12,000 cubic feet per second from 10,000 cfs, raising the Iowa River level through Coralville, Iowa City and downstream communities. Iowa City is experiencing minor flooding, especially in City Park and nearby residential neighborhoods. Dubuque Street, paralleling the Iowa River as a major link between downtown and I-80, remains open. The National Weather Service is revising downward its Cedar River crest forecast for Cedar Rapids. The highest water is now expected to be 14.4 feet on Saturday, well below the previous forecast of a crest near 20 feet.